Son of Giambattista Sarto, a village cobbler, and Margherita Sanson, living an impoverished childhood as one of eight children. Baptized on 3 June 1835. Confirmed on 1 September 1848. He early felt a calling to the priesthood. Studied at the seminary of Padua, Italy, and was known as an exceptional student. Ordained by Blessed Giovanni Antonio Farina on 18 September 1858. Chaplain at Tombolo from 1858 to 1867. Archpriest of Salzano from 1867 to 1875. Canon of the Treviso cathedral chapter in 1875. Rector of the Treviso seminary and its spiritual director for nine years. Primicerius of the cathedral in 1879. Chancellor of the diocese of Treviso. Vicar capitular from December 1879 to June 1880. Bishop of Mantua, Italy on 10 November 1884. Assistant at the Pontifical Throne on 19 June 1891. Created cardinal-priest of Saint Bernardo alle Terme on 12 June 1893. Patriarch of Venice on 15 June 1893. 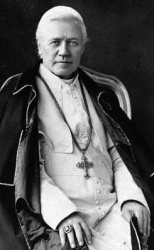 Chosen 257th pope in 1903, taking the name Pius X. Issued decrees on early Communion (age 7 instead of 12 or 14 as previously). Destroyed the last vestiges of Jansenism by advocating frequent and even daily Communion. Reformed the liturgy, promoted clear and simple homilies, and brought Gregorian chant back to services. Revised the Breviary, and teaching of the Catechism. Fought Modernism, which he denounced as "the summation of all heresies". Reorganized the Roman curia, and the other administrative elements of the Church. Worked against the modern antagonism of the state against the Church. Initiated the codification of canon law. Promoting Bible reading by all the faithful. Supported foreign missions. His will read: "I was born poor; I lived poor; I wish to die poor." Born to pious peasants, the son of Stanislaus Findysz and Apollonia Rachwal. Received his early education from the Felician Sisters. Joined the Marian Solidality as a young student. Entered the major seminary in Przemysl in the autumn of 1927. Spiritual student of Blessed John Balicki. Ordained on 19 June 1932. Assistant parish priest at Boryslaw, Poland (in modern Ukraine) on 1 August 1932. Assistant parish priest at Drohobycz, Poland (in modern Ukraine) on 17 September 1935. Assistant parish priest at Strzyzów, Poland on 1 August 1937. Assistant parish priest at Jaslo, Poland on 10 October 1940. Parish administrator and then parish priest in Nowy Zmigród beginning on 8 July 1941. On 3 October 1944 Ladislaus and the rest of the town were expelled by the retreating German army. Having survived the oppression of the Nazis, he returned on 23 January 1945 to rebuild the parish, and to care for war refugees under the oppression of the Communists. He saved several Greek Catholic families who were being persecuted and exiled by the Communists. From 1946 until his death he was under surveillance of the secret police; that same year he was recognized for his good work by being declared an honorary canon. Ordered to stop teaching the catechism in 1952. In order to hinder his work, in 1952 and 1954 he was ordered to live outside the area of his parish. Vice-dean of the Nowy Zmigród deanery in 1957; dean in 1962. In 1963 he started the Conciliar Works of Charity, a letter writing campaign to parishioners to exhort them to return to the Church, and to spread the word of the reforms of Vatican II. The Communists took a very dim view of this work, and on 25 November 1963 Father Ladislaus was arrested and imprisoned in the Rzeszów Castle, two months after major surgery to remove Ladislaus' thyroid gland. A standard show trial was conducted on 16 and 17 December 1963, and Ladislaus was given a 30 month sentence for the crime of "forcing" religion on his parishioners. This was followed by (also standard) series of published slanders and lies to discredit Ladislaus while he was being abused and starved in prison. Transferred to the central prison hospital on 25 January 1964, his health broken, and suffering from cancer of the esophagus. Surgery was postponed, and Ladislaus was permitted to suffer and deteriorate. Released from prison to his parish, Nowy Zmigród, on February 1964 due to his health, but civilian doctors proclaimed his tumors inoperable. Martyr. The son of José Blanch Bosch, a secretary, and Maria Ferrer Raurell, Jacinto was baptized on the day of his birth in his parish church of Santa Maria. His was a large and pious family; all his siblings would enter religious life, five of them as Claretian Missionaries. He made his First Communion at age 12, and entered the Claretian Missionaries' novitiate on 21 July 1884 in Vic, Spain at age 16. He studied in Vic, then Santo Domingo de la Calzada, and made his profession on 18 September 1885. Ordained a priest in the diocese of Zaragoza, Spain on 12 March 1892. As a seminarian, Jacinto had not been noted for scholarship, but was an immensely practical young man. He was assigned to teach Latin, and soon developed the speaking skills to preach in a series of Spanish cities for several years. In the early 20th century, anti–Catholic violence broke out in Spain. Father Jacinto convinced some local nuns to wear street clothes instead of their habits in order to work in the community without persecution. He conducted a covert ministry in private homes for those who feared making their faith public, and he mixed with anti–Catholic mobs to talk them down from burning churches. His church and community house in Barcelona were burned in 1909. Jacinto was made superior of the community, and oversaw its reconstruction from 1911 through 1913. Superior of the Claretian community in Sallent, Spain in 1920 where he oversaw re-construction of their entire infrastructure. In addition to a strong devotion to the Eucharist, the Blessed Virgin Mary and the Rosary, Father Jacinto was a student and devotee of Father Anthony Mary Claret, the founder of the Claretian Missionaries. He served as Vice-Postulator the Cause for Canonization of Saint Anthony Mary Claret and Father Francesc Crusats Franch from 1916 to 1936, and he published a bibliographic study of Father Claret. When the Spanish Civil War began in earnest, Father Jacinto moved to the house of Don Eugenio Bofill from which he continued to conduct his covert ministry, celebrating Mass in private homes, receiving other Claretians for instruction, hearing Confessions, teaching catechism, and leading groups to pray the Rosary. On 17 August 1936, fearing his work and visitors would draw attention to the Bofill family, he moved out; he was seized by the militia on 19 August. We have no record of his last two days, but he was executed on 21 August for the crime of being a priest. Martyr. Daughter of Rainiandriantsilavo and Rambahinoro. Raised by her paternal uncle, Rainimaharavo, the commander-in-chief of the Malagasy army, the girl grew up in the animist faith of her ancestors. She began attending a Catholic school at age 13 and was immediately drawn to the faith. A convert, baptized on 1 November 1863, taking the name Victoire. A change in the national politics led to antipathy to the French and to Catholics; Victoire's family, being part of the ruling class, put her in a Protestant school and threatened to make her an outcast if she held to her new faith, but she would not change. Victoire felt drawn to religious life, but her family arranged a marriage for her to Ratsimatahodriaka, a cousin and leading figure in the military; they were wed on 13 May 1864. Her new husband was a violent, womanizing drunk, and all of Victoire's friends urged her to divorce him; she refused, saying that marriage was a sacrament and could not be broken, and instead she prayed for his conversion. In 1883 the political situation in Madagascar turned forcefully against the French. All foreign missionaries, which included all priests, were ordered out of the country; Catholic schools and churches were ordered closed, Catholic gatherings were outlawed, and all Catholics were ordered to renouce the Church or be considered traitors. The faithful ignored the orders, held prayer services in boarded up churches, catechized new converts, and did it all peacefully and without a priesthood. Victoire helped lead and support the movement, keeping schools open, sometimes being the first into a church, shaming the police guards into letting the Christians enter. During 1885 peace was established between France and Madagascar, and on 7 March 1886 the missionaries were allowed to return; they found the faith alive and growing. Victoire was widowed in in 14 March 1888, her husband asking forgiveness and being baptized on his death bed. She devoted the rest of her life to caring for the poor, the sick and the imprisoned, with all her free time spent in prayer. Born wealthy and orphaned young. When he was old enough to choose for himself, he gave away his fortune, and became a monk at the Bogoroditskaya monastery. Bible scholar, priest, and noted preacher. A stern and forceful man, his sermons concerned the Day of Judgement, and he lived his life as though he were about to be judged. He was very popular among the laity, gentle and ever concerned with the sick, the abused, and the troubled. However, it was a different matter among the clergy, many of whom were openly jealous or hostile toward him, and with the wealthy laity who opposed his teaching on poverty, an austere life, and the emptiness of worldly wealth. His abbot was pressured by local authorities, and he ordered Abraham to stop preaching. To escape the disturbance, Abraham withdrew from the monastery, and joined the monks of the Holy Cross. He made no friends there, either, and in order to silence him some of his critics brought charges of moral and theological errors, heresy and immorality against him. He was acquitted in his first trial, so he was tried again. When he was acquitted again, he was ordered back to the Bogoroditskaya monastery, stripped of his priestly functions, and for five years he lived under a cloud of suspicion and disciplinary orders. During a time of drought, the people demanded that he be reinstated as the hard times made them crave the intervention of an obviously holy man; the bishop re-opened his investigation, and this time Abraham was cleared of all charges. Legend says that Abraham then prayed for the city, and had not even returned to his cell in the monastery before it started to rain. Appointed abbot of the small, impoverished Mother of God monastery in Smolensk, he lived the rest of his life in quiet prayer, supervising his house and receiving visitors, but declining to preach for fear of causing dissension in the faithful. His biography was written by one of his brother monks, and has survived to today. 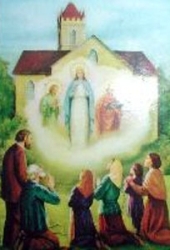 Our Lady, Saint Joseph and Saint John the Evangelist appeared in a blaze of light at the south gable of Saint John the Baptist Church, Knock, County Mayo, Ireland. They appeared to float about two feet above the ground, and each would occassionally move toward the visionaries, and then away from them. The Blessed Virgin Mary was clothed in white robes with a brilliant crown on her head. Where the crown fitted to her brow, she wore a beautiful full-bloom golden rose. She was praying with her eyes and hands raised towards Heaven. Saint Joseph wore white robes, stood on Our Lady's right, and was turned towards her in an attitude of respect. Saint John was dressed in white vestment, stood was on Mary's left, and resembled a bishop, with a small mitre. He appeared to be preaching and he held an open book in his left hand. Behind them and a little to the left of Saint John was a plain altar on which was a cross and a lamb with adoring angels. The apparition was witnessed by fifteen people. Miraculous healings were reported soon after the area, and it is now a major pilgrimage destination. Franciscan friar at the monastery in Chelm Lubelski, Poland, taking the name Bruno. Arrested for his faith by the Nazis in November 1939 and sent to the Dachau concentration camp which had a special unit for dealing with imprisoned Catholic clergy. Bruno spent his time in the camp ministering to other prisoners. One of the 108 Martyrs of World War II. Daughter of Almanzor, Muslim caliph of Lerida, Catalonia. Sister of Saint Bernard and Saint Maria. Convert, brought to the faith by her brother Bernard. The three tried to convert their brother Almanzor, who turned them over to Moorish authorities. Martyr. Daughter of Almanzor, Muslim caliph of Lerida, Catalonia in modern Spain. Sister of Saint Bernard of Lérida and Saint Grace of Lérida. Convert, brought to the faith by her brother Bernard. The three tried to convert their brother Almanzor, who turned them over to Moorish authorities. Martyr. Son of Almanzor, Muslim caliph of Lerida, Catalonia. Brother of Saint Mary and Saint Grace. Convert. Benedictine Cistercian monk at Poblet, taking the name Bernard. With his sisters, he tried to convert his brother Almanzor, who turned them over to Moorish authorities. Martyr. A devout Christian woman married to a pagan priest. Mother of Saint Theogonius, Saint Agapius and Saint Fidelis. Martyred in the persecutions of Diocletian. She was forced to watch her three sons be executed first; she prayed for them and encouraged them to not abandon their faith. Priest in the apostolic vicariate of East Tonkin. Martyr. Christian soldier in the imperial Roman army. Comforted Saint Cisellus and Saint Camerinus after the boys had been sentenced to death. Martyred in the persecutions of Diocletian. Military tribune, a position known as cornicularius. He was so impressed and moved by the courage of Saint Aeapitus under torture for his faith that he announced, "The God of Aeapitus is my God." He was immediately arrested and executed by order of Aurelian. Martyr. Wealthy married woman in Rome, Italy. Widowed, she spent her fortune sheltering persecuted Christians. Saint Lawrence of Rome used her house as a base for alms-giving and charitable work. Martyr. The church of Saint Mary in Dominica in Rome is named for her. Soldier in the imperial Herculean Legion serving under an uncle of Julian the Apostate. Tortured and executed for refusing to change the Labarum of Constantine, a Christian banner, for a pagan one. Martyr. Bishop of Mende, France. Captured by invading barbarians, but was offered his freedom if he would reveal where his flock was hiding or sacrifice to idols; he declined both offers. Martyr. Benedictine monk at Saint-Crespin-en-Chaie, Soissons, France. Abbot at the monastery of Saint John the Baptist Abbey at Valenciennes, France. Persecuted by the Count of Hainault (in modern Belgium). Mercedarian nun. Founded the Assumption monastery in Seville, Spain. Bishop of Utica in North Africa. Martyred with all his flock. Christian soldier of the Herculean cohort. Ordered by Julian the Apostate to remove the monogram of Christ from the cohort's standard; he refused. Martyr. Soldier; officer in the imperial Herculean Legion serving under an uncle of Julian the Apostate. Tortured and executed for refusing to change the Labarum of Constantine, a Christian banner, for a pagan one. Martyr. Member of the Patrician class in the area around Constantinople. Martyred in the late 3rd-century persecutions of Diocletian and Maximian Herculeus. Philosopher and teacher martyred with several of his spiritual students in the late 3rd-century persecutions of Diocletian and Maximian Herculeus. Son of Saint Bassa of Edessa. Martyred in the persecutions of Diocletian. Convert, with his two sisters, from Islam to Christianity; they were all martyred for this choice. Bishop of Clermont, France. Ordained Saint Gregory of Tours as deacon. The church at Breedon-on-the-Hill, Leicestershire, England is dedicated to this saint, but nothing of his story has survived. First century bishop of Verona, Italy.